Originally released in 1997, the highly-rated Perdomo Reserve 10th Anniversary Champagne cigars are blended using well-aged Cuban seed filler and binder tobaccos grown exclusively by the Perdomo family in the highly fertile regions of Nicaragua. 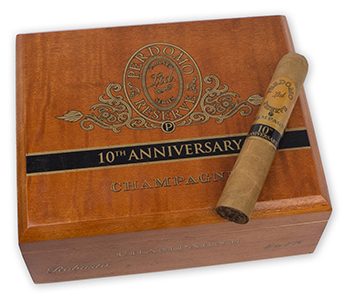 Wrapped in a stunning Champagne Connecticut leaf aged 6 years, the mild to medium-bodied 10th Anniversary Champagne cigar is beautiful to behold and to smoke, imparting layers of complex flavors, a rich aroma, and finishing with a sweet, creamy flourish. Smoke a premium handmade Perdomo Reserve 10th Year Anniversary Champagne and you'll appreciate what a decade in the making will do for a cigar.